Excellent wines, gently shelving beaches, rolling hills, cobbled streets, myrtle/oak/mulberry trees - a truly peaceful and low key island. 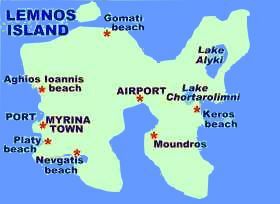 Limnos is ideal for those who really want to experience a Greek island. Myrina is a living market town not an open air disco. Take a good book, kick-back and relax.